True to its name, Bounty beach really does enjoy nature’s bounty. Its home to stellar beaches and soft white sands. Located at a distance of 100 kilometres from Cebu at Malapascua, Bounty beach is perhaps the best stretch of sand around Cebu, great for activities like snorkelling and scuba diving. A perfect opportunity to get away from the hustle-bustle of the city, the beach is great to spend time with family and friends. You can reach Malapascua either by bus or boat from Cebu. How popular is Bounty Beach? 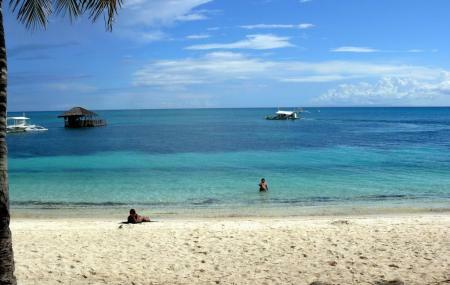 People normally club together Malapascua Garden Resort and Ocean Vida Resort while planning their visit to Bounty Beach. People also prefer to start their day with Bounty Beach. Great beach and the class restaurants and hotels are just along the beach. This is where the new port is located. Also, you can swim anywhere even in front of a certain hotel/restaurant where you are not checked in or ordering. It is accessible to everyone. The restaurants/hotels along this beach is quite expensive. If you're on a budget, rather go inside the island to uncover cheaper options. All that you can see in the Bounty Beach area of Malapascua Island. The most popular beachfront. There are other places like Langob beach but only for those who want solitude. Malapascua is not only for divers, you can enjoy the beachfront and swim with less foot traffic compared to more popular beaches in the Philippines.